Welcome to month three of the Gluten-Free Ratio Rally! If you’ve stumbled upon this post and are interested in reading more about what the Rally is all about, check out the post from our inaugural run when we all shared ratios and recipes for pancakes. 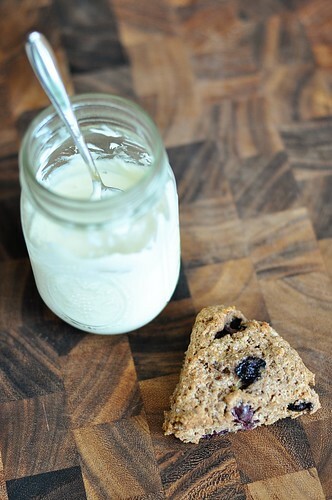 This month we’re sharing our recipes and ratios for scones. Mine is below, read on to see how it came to be. When I graduated from college, it was a strange sort of non-event. There was no ceremony, no Pomp and Circumstance. I took my finals, turned in papers, and was done. A little into my second year at NYU, after juggling classes with a full schedule of auditioning and film shoots, I had decided that something had to give. I was either going to drop out and focus on my work, take a leave of absence, or kick things into high gear and get this whole school thing over with. After some parental urging, I went with option three and wound up officially graduating two summers later, just a few weeks shy of my third anniversary in this city. So while the people I had met during orientation week were preparing for their last year of school, I was facing that wide expanse ahead called Life. It was perhaps a bit odd to have completed that one phase and entered into this other so seamlessly (there were always ceremonies along the way, weren’t there? ), but it worked for me. Chris and I were living together in Brooklyn at the time. He threw me a small surprise party, for just the two of us, to mark the occasion. Streamers were strung from the ceiling and he had a Papa John’s pizza awaiting my arrival (this was back when Papa John’s was a delicious novelty for us, before we instead began associating it with feelings of post-binge self-disgust and long before gluten was an issue). Chris can cook, but he wasn’t often in the kitchen. I had made that my domain early in our relationship—I think my knives took up residence on the counter before I even had a drawer in the dresser—and to no complaint. Also familiar with my affinity for the kitchen, my future in-laws sent me a copy of the Joy of Cooking as a graduation gift. I remember opening it and noting what a thoughtful present it was, though simultaneously thinking that it was a book I’d likely never use. (Looking back now, of course, it was almost prophetic.) I just couldn’t imagine cooking from such a massive text filled with so many basic recipes. The Food Network website and the newest Rachael Ray release were all I’d ever need. It’s funny how time changes things. As I sat down to my graduation dinner with my future husband, I’d have never guessed that only a few years later I wouldn’t be able to eat the pizza on our table ever again. I wouldn’t have believed you if you told me that I would soon voluntarily quit acting and spend more than two years working in finance. And I certainly wouldn’t have predicted that I would be writing a food blog and poring over that gigantic red and white book, using it as research, so that I could write recipes of my very own. Gluten-free recipes. When I started making scones earlier this year for a side project that I’m working on, I consulted the Biscuit & Scone section of my copy of the Joy of Cooking. I knew that biscuits and scones were incredibly similar and was hoping to learn the difference between the two. Sifting through those basic recipes seemed the best way to do that. From what I was able to gather, the most fundamental distinction is that scones contain eggs. Using that information and recipes in that book as a guide, I wrote my basic scone recipe: a feather-light variation on my Sweet Cream Biscuits. I had no idea I’d need to consult this recipe when the Ratio Rally came around this month. My plan was to take Ruhlman’s ratio and create something based on that, just as I have for the past two months. The thing is, Ruhlman doesn’t offer a standard ratio for “scones,” and some of the other ratios that were floating around felt uncomfortably different from the successful recipe I had created earlier this year. After a little number crunching (Thanks, Ratio App! ), I realized that my scone recipe, unsurprisingly, fit very closely with Ruhlman’s ratio for biscuits. The only difference was that the liquid proportion of the biscuit ratio was composed of both liquid and eggs in my scones. So I gave it a go. And it worked. 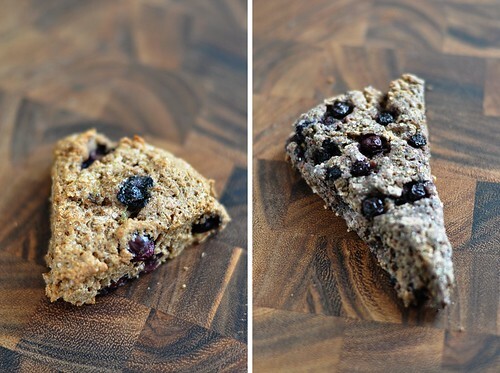 (Left: Scone made with fresh berries, from a batch of 6. All of my biscuit and scone recipes up until this point have been starch-heavy. I build recipes based on flour properties and my goal was always to have ultra light and flaky results. But sometimes you just want something a little more substantial, and it never hurts to diversify. So, with a freshly minted ratio on my side, I created a heartier whole grain scone. The cream and lemon zest folded into my previous scones seemed a bit too dainty for this party, though. 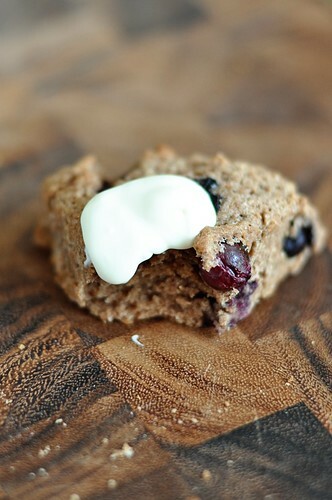 Blueberries, buttermilk, and a touch of demerara would be more appropriate company for a mound of earthy teff flour. As much as I want to take all the credit for these, though, I can’t. There’s a good chance they wouldn’t exist if a certain book hadn’t showed up on the stoop of that Carroll Gardens apartment several years ago. Back when I was an actress. Before I’d ever heard of asset-based investments. When cooking was just something I did for fun and to impress my boyfriend. Thanks Mom & Dad (in-law), it’s almost like you knew. If blueberries aren’t in season where you are, use frozen berries instead of fresh. You’ll have to accept the fact that your scones will be purple, that the dough will be ice cold and a bit stickier in your fingers, but the end result will taste far better than if you use those tart little guys from half a country away. I recommend making these as written, in batches of 6. You can make a batch to yield a dozen, but the wedges come out long and skinny (see purple scone above). They’ll taste the same either way, but I tend to think the half dozen batches are prettier. Preheat the oven to 375 degrees. Line a baking sheet with a silpat or parchment paper. butter until there are no pieces any larger than a pea. Stir in the blueberries. Whisk the egg and buttermilk together. Stir gently into the flour mixture. When it becomes difficult to incorporate the flour by stirring, use your hands to gently work the mixture together. If you are using frozen blueberries, mix with your hands very delicately, taking care to leave as many berries as you can intact. 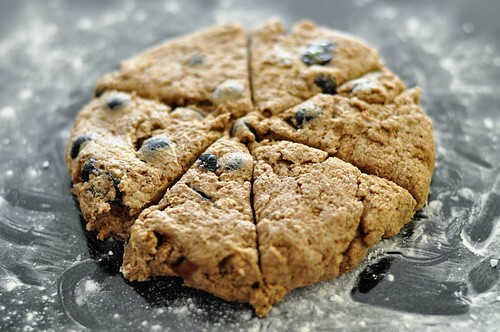 The dough will take on color and will also be quite sticky from juice of the berries. When the dry ingredients are mixed in and the dough mostly holds together, turn it out onto a work surface that has been dusted well with potato starch. Gather the dough into a round disc and pat it out to a 3/4-inch thickness, using potato starch as needed to help with any stickiness. Use the dull side of a knife to cut the disc in half. Cut each half into three wedges. Transfer the scones to the prepared baking sheet. Brush with the melted butter and sprinkle with additional sugar if desired. Bake for 20-25 minutes, until the edges are golden brown. Scones are at their best on the day they are prepared. 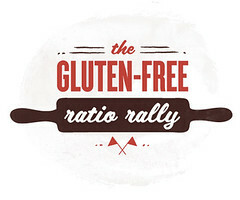 As always, the Gluten-Free Ratio Rally is about coming together and sharing and learning. Check out all the wonderful contributions from my fellow rally participants! smart to post with fresh and frozen… and to include photos! amazing the different look of the end products. blueberries are always comfort-y to me. thanks for sharing! Wow this makes me so jealous of your blueberries, I can't wait until I can get some! Beautiful scones, and love seeing everyone's different ratios. With gluten-free baking, I like referring to the more basic classic cookbooks, and using them as a guide. 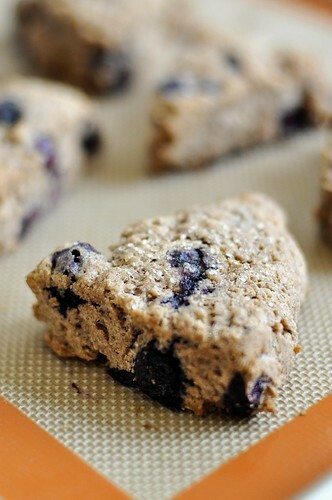 Clearly, it worked wonders with your blueberry scones! Good tip about the differences in the berries and recipe sizes! I have my mom's copy of Joy of Cooking and treasure it like a child so I can relate to your post. I love the addition of the teff to give it that earthy flavor. Sounds wonderful! You're welcome, daughter-in-law! And we're proud of you and all your accomplishments. kind of interesting what can happen when you double a recipe, huh?! I use the red and white plaid book a lot for ideas and information in my baking/cooking.you used a word that I didn't know. so I went and looked it up to find that I did know what demerara was it is just turbinado sugar. ha! learn something new every day. Beautiful baby! Beautifully written (brought a tear to my eye), and beautifully crafted and executed! You have a gift for making exquisite treats (among your many other gifts)and, of course we knew! You are most welcome-love ya, DIL! Love the story about the paths your life has taken!And those scones look great. I love blueberries! Every year I freeze bags and bags of organic Maine blueberries, in hopes that the stash will last us until the following season. Never works. In fact, we currently are down to our last half-bag, and there's no way I'll be able to hoard them until August! Especially not with a hearty blueberry scone recipe like yours calling my name. I love this post…and love how you are in NYC…let's try to meet up for a lil' gluten-free date! Great idea posting the fresh vs. frozen berries! Very clever. Have a great weekend!